Education can help give girls and boys the skills they need to actively participate in society and play leadership roles in public life. Education and lifelong learning help develop empowered, critical, mindful and competent children and adults of both sexes who can actively participate in and lead processes of social, behavioural and environmental transformation, at the individual and societal levels, that promote sustainable development. Meaningfully and equitably engaging women and men as leaders and decision-makers in defining policies and processes at the global, national and local levels significantly contributes to gender equality in society. It is crucial, in and of itself, for realizing gender equality in terms of equal opportunity, as is made explicit in target 5.5 of SDG 5 on gender equality and empowerment. It also builds better understanding of the differing needs and situations of women and men and is thus more likely to result in change that meets these needs (Brody, 2009; O’Neill and Domingo, 2016). Unfortunately, gender inequality in public governance is highly visible, reflecting and reinforcing existing norms on female participation in political and economic life. Limited female participation in governance structures where key policy issues and resource allocations are decided often negatively affects women’s political, economic and social opportunities. Across the world, men continue to dominate leadership and decision-making positions in political, economic and public life (Figure 18). Only 20% of members of lower or single legislative bodies, 19% of heads of state or government and 18% of ministers are women. 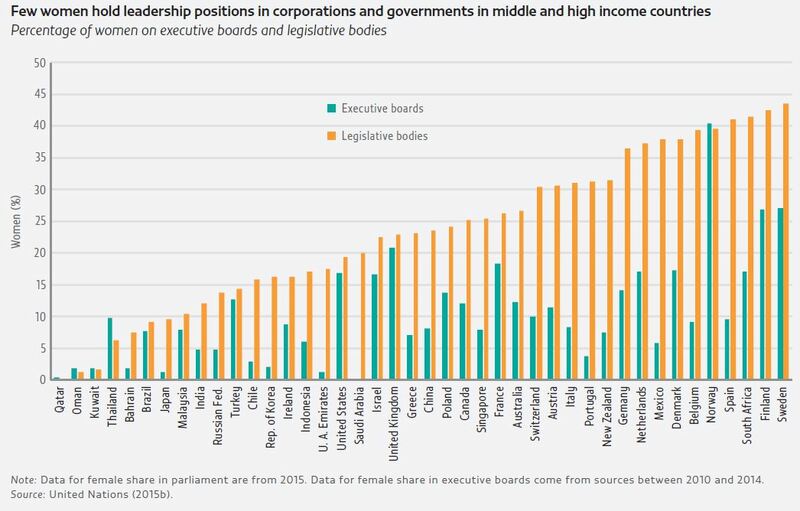 Among the 43 countries with data, women hold less than 25% of seats on private company executive boards everywhere but Finland, Norway and Sweden; the share is below 2% in 8 countries of Eastern Asia and Western Asia (United Nations, 2015b). And women are often absent from or peripheral to decision-making in most cultures, social organizations and global institutions, in families and in major religions (Domingo et al., 2015). In recent years, women’s political representation has improved. The latest data show more women than ever elected to national parliaments; the global average has been increasing and as of 1 June 2016 was 22.7%, far from equality but an improvement over 13.8% in 2000 (Inter-Parliamentary Union, 2016). Formal requirements for women’s representation in local government, such as reservation programmes in India and municipal representation in South Africa, can increase women’s visibility (Deininger et al., 2011). But their impact on underlying power dynamics is unclear (Beall,2010), and representation does not automatically translate to real authority, influence or autonomy (O’Neill and Domingo, 2016), often more because of gendered prejudices than women’s actual ability. Even when chosen for ministerial positions, women are more often given ‘soft’ policy areas such as education, health, gender and culture, rather than positions considered more influential, such as finance and defence (Krook and O’Brien, 2012). From civil society to community councils to national office and international bodies, education and lifelong learning opportunities help give women skills needed to take on public leadership. Basic education can provide women with foundation skills such as literacy and can help foster confidence and communication skills. Further education and professional, technical and legal training are often required for women to be considered credible, influential, high level leaders and decision-makers (O’Neill and Domingo, 2016; Sperling and Winthrop, 2015). A study of women leaders at various government levels in eight countries, including Brazil, Egypt, Ghana and Palestine, found that those with higher education levels held office in the higher tiers of government (Tadros, 2014). Increasing women’s educational attainment, however, does not guarantee greater gender equality in political participation. In Malaysia, female enrolment has increased, particularly in tertiary education, but women’s political participation has remained steady over the past 10 years (Salleh, 2012; World Bank, 2015). Some countries with historically high levels of girls’ and women’s education, such as the United Kingdom and United States, have fewer women in senior political posts than some countries with fewer girls in school (World Bank, 2011). Nevertheless, higher educational attainment, particularly secondary level and above, can increase knowledge and skills for participation in leadership positions and improve attitudes about gender equality. Schools can also give young people valuable opportunities for active participation in leadership roles, such as girls’ and boys’ clubs and school committees (Lloyd, 2013; Sperling and Winthrop, 2015). Non-formal initiatives can provide similar opportunities (Box 3). Greater gender equality in leadership and decision-making in public institutions must be actively demonstrated. When leaders in India are women, girls’ aspirations and advancement in education improve. Across the 16 biggest states in India, a 10% increase in the number of women involved in district politics would lead to an increase of nearly 6% in the probability of primary school completion, with a larger impact on girls’ education (Burchi, 2013). Non-formal education can offer young people opportunities to develop the leadership skills to promote gender equality in their peer groups and communities and throughout their lives. The Action for Adolescent Girls programme (2013–2017) supports interventions in 12 countries, including Ethiopia, Guatemala, India, Niger, Yemen and Zambia, to develop local networks of young female leaders, training young women and older girls to be leaders within their communities and run programmes for younger adolescent girls. The programme delivers sexual and reproductive health education and life skills training combined with community mobilization and advocacy activities to promote girls’ rights. Two projects, the Power to Lead Alliance and Innovation through Sports: Promoting Leaders,Empowering Youth, reached 196,000 girls and 136,000 boys aged 10 to 14 in 8 countries:Bangladesh, Egypt, Honduras, India, Kenya, Malawi, the United Republic of Tanzania and Yemen. Implemented in 2008, the projects targeted girls but also engaged boys to change gendered attitudes and behaviours and enable participants to advocate for gender equality and girls’ rights. Participants developed leadership skills, including decision-making and self-confidence, through engagement in community groups and activities such as sports, drama and environmental clubs. Final evaluations found that the majority of participants showed more appreciation of equal rights and more positive attitudes about gendered responsibilities and social norms. In March 2016, at the 60th session of the Commission on the Status of Women at UN Headquarters in New York, a youth forum was held for the first time, recognizing that young women and men must be actively involved in implementing the 2030 Agenda and achieving gender equality. Sources: Adolwa et al. (2012); UN Women (2016c); UNFPA (2014). Studies confirm the importance of female role models in schools and professions. Female students in the United States were found to perform better in introductory mathematics and science courses if taught by women, and more likely to pursue careers in STEM fields (Carrell et al., 2009). Observing and interacting with female experts in these fields improved female students’ attitudes about the fields (Stout et al., 2011). The proportion of female teachers is an important indicator of progress towards gender equality, especially in lower income countries. In countries with more rigid gender norms, female teachers can attract girls to school and improve their learning outcomes (UNESCO,2015a). Yet the presence of female teachers is heavily unbalanced between levels of education and between countries (Figure 19). Globally, 94% of pre-primary teachers are female, compared with 64% in primary, 56% in lower secondary and 50% in upper secondary. At the upper secondary level, the female share in teaching staff ranges from a high of 83% in Myanmar to a low of 4% in Liberia. Gender-equitable leadership is a major concern in education. Women continue to be under-represented in senior management positions, on school boards and in education ministries in rich and poor countries alike (UNESCO, 2015b). In 2015, just 69 of 191 education ministerial positions were occupied by women (Inter-Parliamentary Union and UN Women, 2015). Even in countries with a majority of female teachers, proportionately fewer women than men rise to school leadership positions (UNESCO, 2015b). 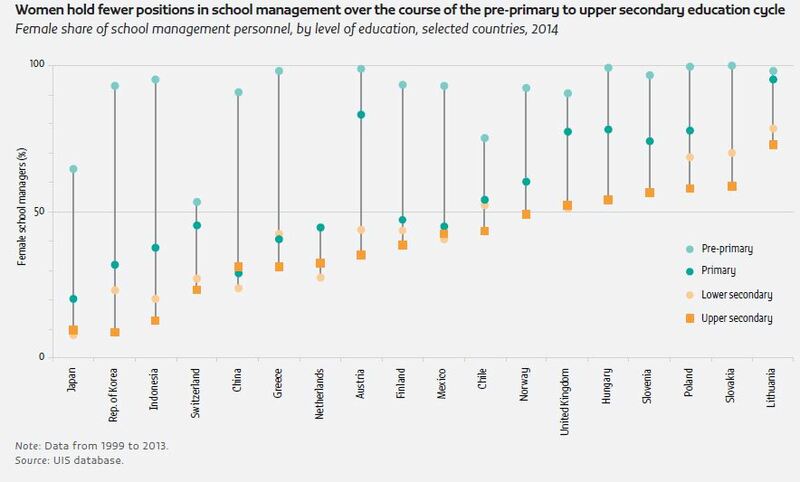 In most countries with available data, the percentage of women in school management personnel is very high in pre-primary education but falls drastically at the primary, lower secondary and upper secondary levels – even in countries known to be more gender-equitable, such as Finland. The average gap in the female share in school management personnel between the pre-primary and upper secondary levels is 45 percentage points. In the Republic of Korea, women’s share in school management personnel declines from 93% in pre-primary to 23% in lower secondary and 9% in upper secondary in 2013 (Figure 20). These trends have multiple implications for girls and boys and for teachers. The low proportion of male teachers at education’s lower levels perpetuates stereotypical notions of caring for young children as women’s work and contributes to children’s understandings of gender. More male principals or administrators than male teachers at the primary level also suggests that men may be promoted to management positions more often than women(Kubacka, 2014). While the involvement of women in leadership and decision-making is crucial, men in positions of influence can and must challenge unequal gendered power dynamics that operate within and across sectors and in formal institutions as well as in communities, families, friendship groups and intimate relationships (MenEngage Alliance et al., 2015). Men and boys can speak out about gender-based violence and discrimination (UNESCO,2015b) and help develop societies that are more inclusive and just. Two useful examples come from sub-Saharan Africa. Founded in 2006, the Rwanda Men’s Resource Centre promotes ‘positive masculinity’ and addresses gender issues. It has trained 3,000 local male and female elected officials from all levels of local government, who are influential in their communities, to reject violence (UNWomen, 2013a). The MenEngage Africa Training Initiative, established in 2012, aims to develop a network of leaders and gender justice advocates to promote gender equality and human rights. It has delivered annual training sessions on gender, public health and human rights to 75 women and men in over 20 African countries, including activists, youth leaders, government officials and media advocates (Sonke Gender Justice, 2016). Understanding gender issues and gaining the skills to address them are necessary not only for leadership but also for participation in political processes in daily life, such as voting, obtaining access to services and claiming social and legal rights. Education helps facilitate political participation and representation. Formal education can inform young people about key social and political processes and their right to participate in them. All education and lifelong learning are key for acquiring political knowledge. Voting is a direct form of political participation, and can prevent and mitigate social tension by providing a democratic alternative to open protest or violence. It also signals societies that are democratic and representative, of women as well as all other groups. But in several young democracies, women are less likely to vote than men, which can be linked to the relatively recent attainment of women’s suffrage, particularly in the Middle East. Poor education experiences, problems with access to information, and lack of awareness or understanding about voting’s importance may also impede women’s (and men’s) ability to vote. Other obstacles to women’s voting are having to stay home to care for family, cultural norms that restrict women’s ability to travel to voting booths, and male family members choosing the candidate they vote for (Brody, 2009). Non-formal education initiatives can help raise awareness and knowledge. In Pakistan, preceding the 2008 national election, a nonpartisan, door-to-door voter awareness campaign gave women information on the importance of voting and the secrecy of the ballot. Women who received this information were found to be 12 percentage points more likely to vote than those who did not, and significantly more likely to choose a candidate independently (Giné and Mansuri, 2011). In Kenya, a merit scholarship programme targeting girls from politically marginalized ethnic groups led to their increased participation in secondary schooling and boosted their political knowledge (Friedman et al., 2011). Voting is an important form of political participation, but elections usually only occur every four or five years. Political engagement and participation must be facilitated not only at the time of elections. Education makes it more likely that discontented citizens will channel concerns through non-violent civil movements, such as protests, boycotts, strikes, rallies, political demonstrations, and social non-cooperation and resistance (Østby and Urdal, 2010; Shaykhutdinov, 2011). From the Arab Spring to the Occupy movement and mass protests on the streets of Brazil and Turkey, people are increasingly using unarmed tactics to challenge oppressive, corrupt and unfair political and economic systems. Active, inclusive participation in political processes enables different voices to be heard and helps both women and men understand and peacefully engage with underlying causes of social problems at the local, national and global levels. It also helps make the electorate and polity more representative of society, holds governments to account more effectively and helps enforce constitutionally guaranteed rights (UNESCO, 2016d). Another example of non-traditional political participation is in the work of Shack/Slum Dwellers International (SDI), a global network of community-based slum federations from 33 countries in Africa, Asia and Latin America. It promotes the rights of the urban poor through a participatory approach, engaging them in community and civic decision-making processes and seeking to improve women’s participation. Women, seen as public decision-makers and agents of change, are encouraged to run community savings groups, which were used to advance women leaders, and get involved in enumerating and mapping informal settlements and making them more visible. Engagement in these processes gives women clear information on community priorities and needs and facilitates their interactions with the municipality (Bradlow, 2015; Patel and Mitlin, 2010). Achieving peaceful, stable and sustainable development requires addressing climate change and pressures on natural resources. Strategies to this end need cooperation and solidarity between women and men, girls and boys across societies, despite differences of context and ideology, as well as listening to and incorporating a diversity of knowledge and experiences. Research suggests women express more concern than men for the environment and support more pro-environment policy, and that countries with higher female parliamentary representation are more likely to ratify international environmental treaties (UNDP, 2011,2012). The UN Office for Disaster Risk Reduction (UNISDR) advocates gender mainstreaming in policy planning and implementation of disaster risk-reduction programmes, recognizing that women as well as men need to be active partners in preventing environmental degradation. In Viet Nam, the initiative Strengthening Institutional Capacity for Disaster Risk Management aims for women to be effectively represented and heard at all levels of disaster risk management, including in leadership positions. In 2014, over 200 women were trained to carry out community-based disaster risk assessments and contribute to local natural disaster prevention and control plans (UNDP, 2016). Women, girls, boys and men possess important skills and capacity to prepare for, respond to and recover from crisis, and to lead change in building resilience and managing risk (HFA2, 2014; UNISDR, 2016). Meaningful participatory processes are needed to give voice to all community members and promote representative leadership. Wagucha, a grass-roots women’s organization in Honduras, trains women leaders to collectively identify challenges for disaster risk reduction, develop sustainable management of natural resources and engage in political advocacy. Using a collaborative approach, the women reduce communities’ vulnerability by using local cultural knowledge and practices to respond to local ecological challenges. To date, 3,200 people in Honduras have directly benefited and 16,000 indirectly benefited from Wagucha’s work (Huairou Commission, 2015). Formal education of good quality can help mitigate climate change and change behaviour. It can help people prepare for climate change and respond to its impact. Education can equip young people with skills and knowledge to understand and engage with environmental problems and the actions required to address them, such as recycling, energy conservation and water-use efficiency. Education can better prepare people for natural hazards. Information is largely lacking about the education characteristics of those affected by natural disasters, but where it is available, it suggests that more educated people tend to have more access to socio-economic resources, greater risk awareness, a higher degree of preparation and appropriate responses, and smaller average losses when disaster strikes. A recent globally comprehensive analysis on disaster vulnerability found that countries with a higher proportion of women having at least secondary education had significantly lower rates of disaster fatalities (Lutz et al., 2014), possibly due to the role women play in enhancing communication and information exchange among family and community members (Muttarak and Pothisiri, 2013). Formal education is not the only means of improving environmental awareness. Traditional, local and indigenous knowledge has proved valuable to early warning systems related to disasters, ecosystem functioning, and climate change adaptation and resilience (Sheil et al., 2015). Women play a significant role in transmitting knowledge. Women of the Arakmbut group in the Peruvian Amazon pass knowledge to younger generations about conservation methods, sustainable resource use and warning signs from natural phenomena (Magni, 2016). Learning from indigenous communities is important to adapt to climate change, develop greater resilience to disasters and help prevent further planetary degradation. Innovative projects draw on local and indigenous knowledge while increasing women’s skills and participation in environmental initiatives (Centre for Environmental Education Australia, 2016). Since 2002, a campaign called Healthy Kids, Healthy Forests has trained over 14,000 women from 800 villages in Central America in skills related to processing Maya nuts, aiming to revive this ancient foodstuff, and giving information on the nuts’ health benefits and the importance of forest conservation (Bovarnick et al., 2010). As of 2013, over 800 women from 64 countries across Africa, Asia, Latin America and the Middle East had been trained through the Barefoot College’s Solar Engineer Programme, a six month course that trains older rural women to use solar equipment to electrify their villages (Remedios and Rao,2013). In Ethiopia, as part of a programme in the Tigray region, where deforestation and poor land and water management causes land degradation, disadvantaged women received training to improve skills in livestock production, forestry and soil conservation, which increased crop yields and enhanced water and food security (UNDP, 2013).